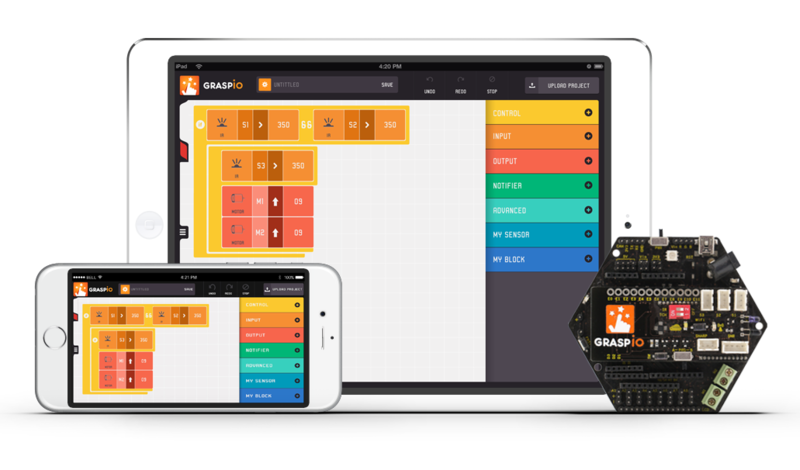 GraspIO is part hardware and part software, and gives everyone an easy way to build electronics projects using smartphones and tablets. It’s the world’s first DIY electronics platform with easy-to-use drag and drop programming mobile app. Launching soon on Kickstarter, sign up at www.graspio.com to get early bird offers when we go live. Almost seven years ago, Apple launched the first iPhone. Over the next few years we were introduced to iPad and Android devices. These pocket size computers have revolutionized the way we use mobile devices. Now, with the same smart devices, we want to empower ‘potential makers’ to transform the way they think, imagine and invent. Whether you are a self-learner getting started with electronics and programming, a DIYer curious about new tools to add to a familiar skill set, an educator who wants to demystify engineering or working on next connected project, or an entrepreneur with “maker to market” mindset, GraspIO lets you simply Drag, Drop and Build!! GraspIO’s Co-founder and CEO, Shangmugha, embarked on his Maker journey during his college days when he participated in robotics competitions that garnered him various awards and recognitions. With a passion for sharing his knowledge, he started organizing Maker workshops on robotics at various educational institutions across India. This is where he met his co-founder Kishore, a pro maker. In the span of a year they trained more than 5000 students together. During these workshops they observed that many students with non-tech background were interested in electronics, robotics and interactive projects but were ignoring it because they lacked technical concepts. This led Shanmugha and Kishore to the idea an electronics platform that could be used by everyone – easily – regardless of age, gender or technical ability. It was 2013 and pretty much everyone had smartphones or tablets. While many other domains has been rethought in terms of mobile, hardware hacking and prototyping are still pursued on PCs. Shangmuha and Kishore want to transition this to mobile. With this mindset they started to build a mobile robot, but during the development phase they realized that it could restrict users creativity and imagination by limiting them to fixed functionalities. Later they decided to use the mobile-based technology to build a platform for physical computing and interactive projects resulting in GraspIO – Graphical Smart Program for IO. 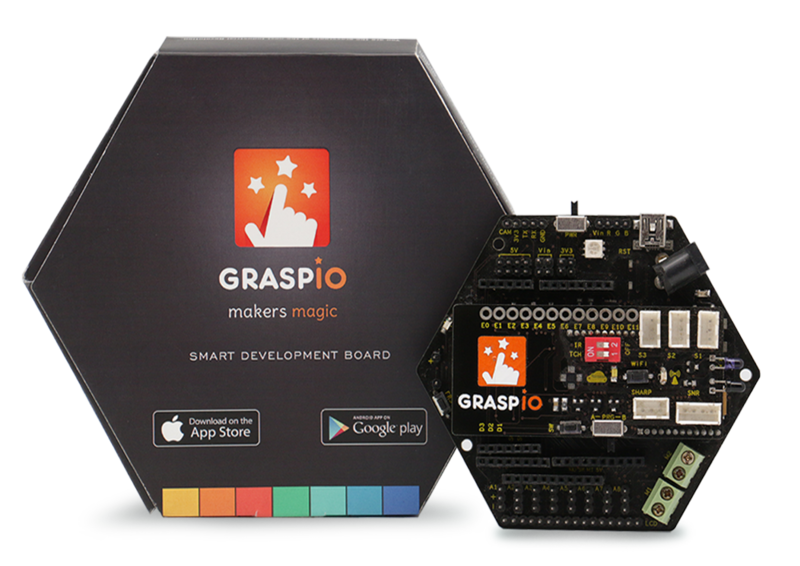 GraspIO works seamlessly with iPhone, iPad and Android; supporting sensors, motors, displays, Arduino, camera, SD Card, Audio and more for the maker in all of us. With onboard Wi-Fi and GIO Cloud it can be programmed wirelessly right from your mobile devices from anywhere over a secure environment. Our favorite platforms, Arduino & Raspberry Pi, are making electronics accessible. But with GraspIO, we want to take physical computing to the next level, by bringing the whole experience to smartphones and tablets. With GraspIO development shields we want to make Arduino and Raspberry Pi accessible from mobile devices.